Regular readers may remember that I quite often travel to spend the day with my Gran, to help with chores and shopping and such. She always takes me to her favourite restaurant (in Haywards Heath, anyway), her local branch of Zizzi’s. I could go on about the delicious pizza, but I’ve done that before. 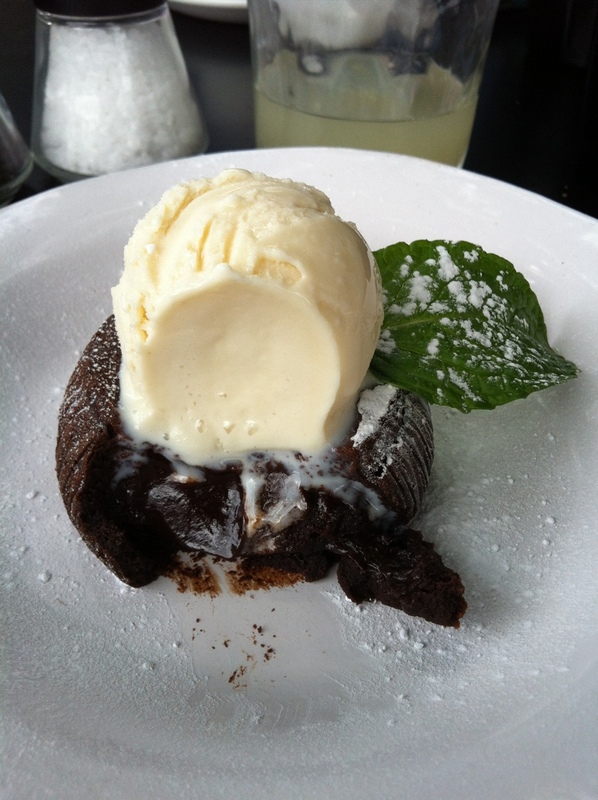 Today I had a proper dessert to go with the meal – a delicious chocolate melt cake. It came out looking so rigid and cake like, then as soon as you press down with a spoon it oozes hot, gooey chocolate in a way that would make a Lindt chocolatier blush. Utter bliss! Hey all, so this post has garnered a lot of love, and one person in particular was inspired to make her Chocolate Molten Cake. This is my friend, blogger CakesByKat, a very creative culinary artist who loves nothing more than baking and “cakorating”. Her brilliant recipe for Chocolate Molten Cake is here, and please do give her blog a look – no one bakes better! I’m clearly eating in the wrong branches of Zizi’s, as I’ve never seen anything in our local one that looks that good! I think we’re very lucky there! Oh, heavenly! I have a recipe for a similar molten cake if you’d like. I would love that! Is it on your blog? It’s not on my blog… yet… but it’s about to be soon! Looks delightful and I’m sure it tastes the same. Love chocolate in any form but love it more when it is warm and oozy like the one in your picture. Can feel myself putting on weight just by looking at the picture….